Employees at HAVCO Wood Products, LLC, in Scott City, Mo., raised $2,217 for Dig for Life, Saint Francis Medical Center’s program that provides free mammography screenings for women who otherwise could not afford them. 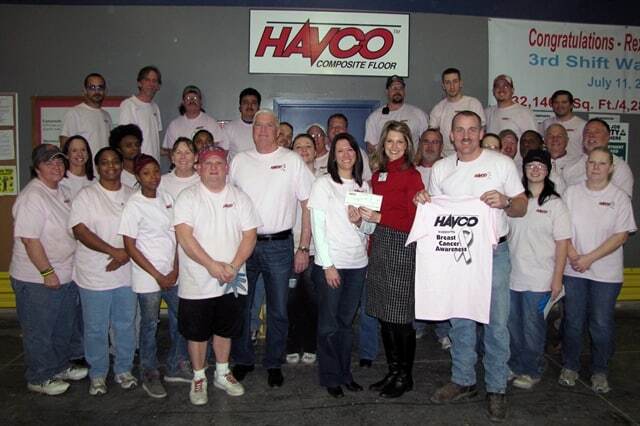 Nearly 450 employees at the HAVCO locations in Scott City and Vonore, Tenn., bought pink shirts in October as part of Breast Cancer Awareness Month and selected Dig for Life as the fundraising recipient. Events supporting Dig for Life are scheduled in October and throughout the year and are listed at www.digforlife.com. Please visit the website or call 573-331-5133to learn more or donate to the cause.